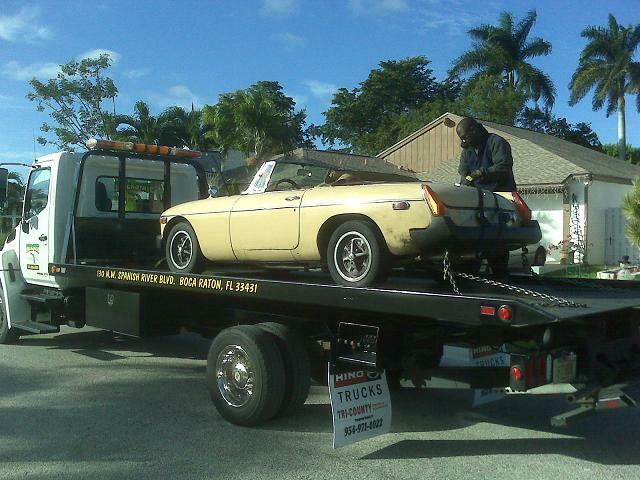 Towed home from Boca Raton, 68 miles. Making the car prettier for spousal acceptance. The car as received, hood and trunk wouldn't close and this badge bar on the front that looked more sad than regal. Looks better in this picture than it did in my garage. I suppose breathless and dead could be synonyms. So yes... it's breathless. That plate was the first thing to go bye-bye. What a difference a few hours and about a gallon of polish make with the high speed buffer. Pretty shiny! Hood and truck now latch closed. Progress. The front of the car looks better without the badge bar. It looks nicer on the wall in my garage. A quick cleanup of the interior reveals that... I need a new interior. This picture is very flattering. Tomorrow should be a big day!